Disclosure: Please note that many of the links below are affiliate links, and at no additional cost to you. Also, keep in mind many of these tools WILL NOT duplicate in your business. My recommendation is to use them if you are ready, and only share them with individuals on your team that show the aptitude and readiness for them. The Optimize Press WordPress theme answers every concern you have with regards to building a blog. I went from using a custom theme that required me to learn HTML, examine and change CSS, over to simply plugging and playing. I can't recommend it highly enough. This entire blog was built on OptimizePress! When someone visits your site, the best way to grab their attention is to talk to them personally. 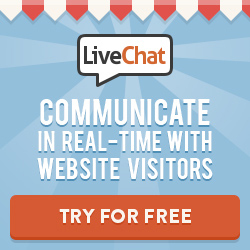 LiveChat has a mobile app as well that let's you manage conversations with visitors real-time. It's a really slick way to engage with your audience and close sales as well!